Plochmann Lane: Happy b'day to the late Elvis Presley! Elvis would have turned 74 today. He had a stillborn twin brother Jessie Garon. Elvis paid $4 to Sun Records in Memphis, TN to record his first two tunes Casual Love & I'll Never Stand In Your Way. He left us in '77. 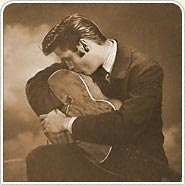 Well, I really like elvis song I cannot stop listen to his son. I don't know why he died for , I wish he where alive.